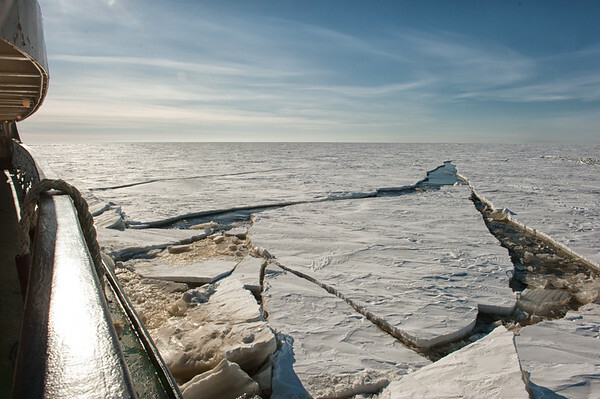 Standing on the bow of the Sampo icebreaker ship, I looked out “to sea.” That sea was a frozen, barren stretch of ice that stretched all the way to the horizon, only broken by lines of churned-up ice left by the ship’s previous excursions. It looked as though we should be stuck, hemmed in as we were by slabs of ice on all sides, yet we were moving ahead at a steady pace, accompanied by regular thumps and cracks emanating from underneath the hull as it bashed through the ice. Looking out “to sea” from the deck of the Sampo. Of everything I had done in Lapland thus far, going out to sea on the Sampo was possibly the most unique. There are very few places in the world where you can cruise on a proper icebreaking ship; it’s fitting that Finland is one of them, since all of its ports are only accessible in the winter once these ships have broken the ice leading into them. So why is Finland so surrounded by ice in winter? The country is lucky enough to be situated on the Gulf of Bothnia and the Baltic Sea, both of which have much lower salt content (a measly 0.2%) than the ocean. This means that the Gulf freezes at just below 0ºC, whereas the Atlantic Ocean would only freeze if its water temperature dipped below -4º. As a result, the shelf ice near Kemi in Finnish Lapland can be over 1.2m thick by March! 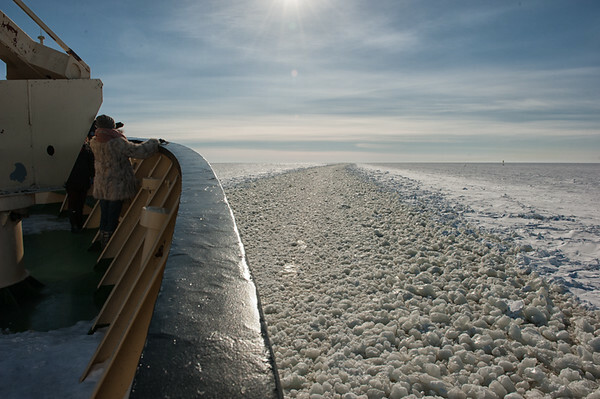 Heading out to sea through the churned-up ice. 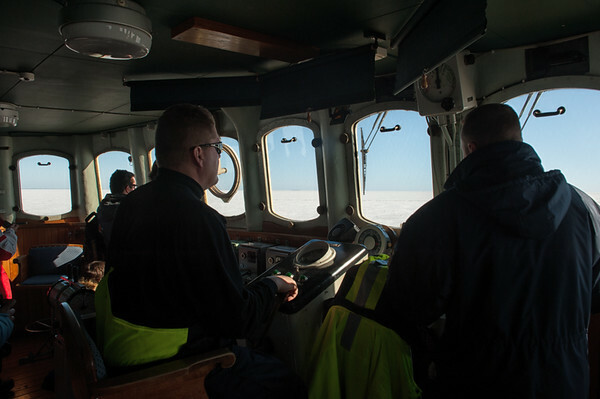 The Sampo, a 52-year-old ship that broke ice commercially for 27 years, is no longer part of the eight ship fleet that goes up and down the Finnish coastline in winter because it’s just too small. It certainly didn’t seem small to me though, especially when our tour guide, Waltteri, told us that the ship weighs 3,500 tons — three times the normal weight of a ship! This hulking great weight, along with the rounded ends with no keels, allow it to literally sit on top of ice up to 1.2m thick and break through it. The ship has no other equipment at all for breaking the ice. The Urho Icebreaker, one of the largest icebreaking ships in Finland, passing us just after I boarded the ship. I hadn’t known this when I first boarded the ship. In fact, when the Sampo pulled up next to me on the ice and lowered a little cherry-picker like basket to me so I could board (leaving my snowmobile waiting on the ice), I was still under the impression that the ship had some sort of machinery that would help it to clear the ice away. So, once we worked our way past the already churned-up ice and began to chart our own course across the Gulf, I was pretty excited to see that we weren’t pushing a pile of ice in front of us. No, we were literally moving forwards onto the ice and watching while massive cracks quickly rushed out from underneath us in all directions; it struck me as surprisingly similar to the special effects in many a sci-fi movie. Perhaps those movies’ directors had once ridden on an icebreaker ship and had been inspired. An ice slab crumbling under the immense weight of the Sampo. 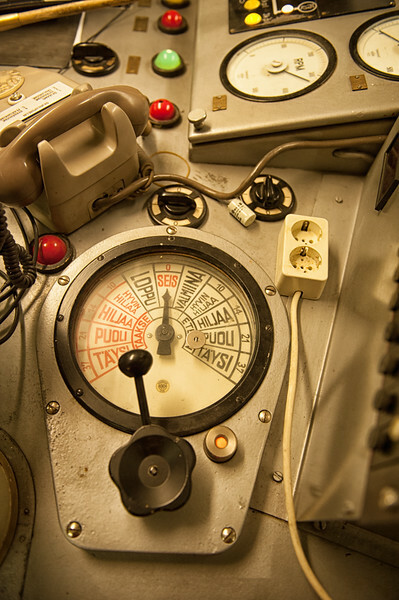 The snaps, crackles, and pops of the shuddering ice resonated in your ears no matter where you were on the ship…except in the engine room. After Waltteri took us up to the bridge to meet the captain and pilot — and see the sweeping view that definitely required sunglasses to look at — he took us to this room deep into the bowels of the ship. The captain and pilot steering the ship towards unbroken ice. The hot air — such a shock after being out in the wind and negative temperatures — pressed in around us, but not nearly as much as the head-bashing roar of the engines that were working so hard to keep the ship moving. 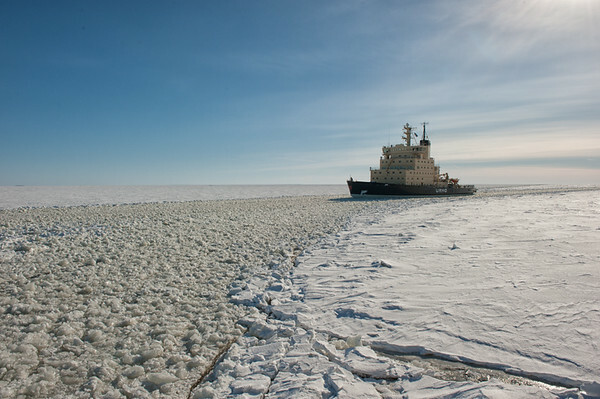 We were happy to put up with a bit of noise if it meant we kept going; after all, what would happen if an icebreaker ship got itself stuck in the ice? Some of the many controls for the ship. As we were getting the ringing out of our ears, Waltteri took us into another room and introduced us to the chief engineer and chief electrician of the ship. When the ship is moving, they are always there, watching all of the gauges and making sure that the ship is running as planned — and even using what looked like a pool cue to press buttons and adjust temperatures accordingly. The ship runs just as it would have when it was built in the 1960s, and while the electrician had an iPad it was only for “officey things and Facebook.” As long as they have the important things covered! 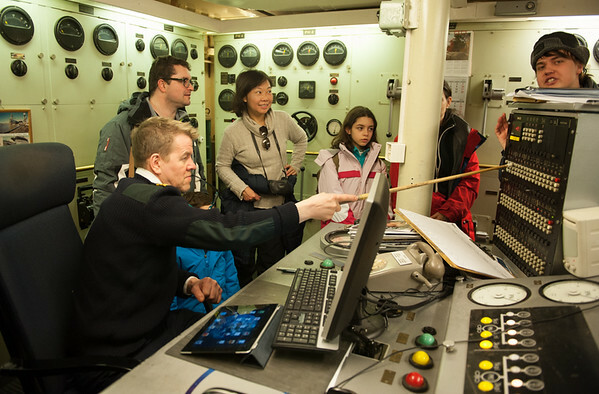 The ship’s chief engineer adjusts the engine temperature while our tour group looks on. Now, it’s all well and good knowing how the ship works, but what happens in an emergency? 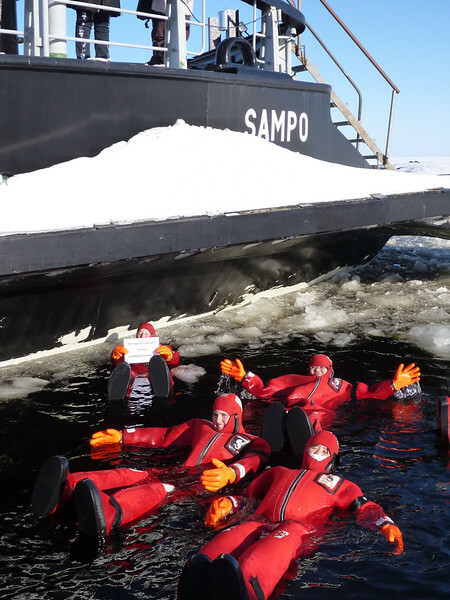 What if the Sampo were to get stuck in the ice? Well, I can guarantee you that the emergency procedures wouldn’t include what we did when the ship pulled to a halt after lunch. 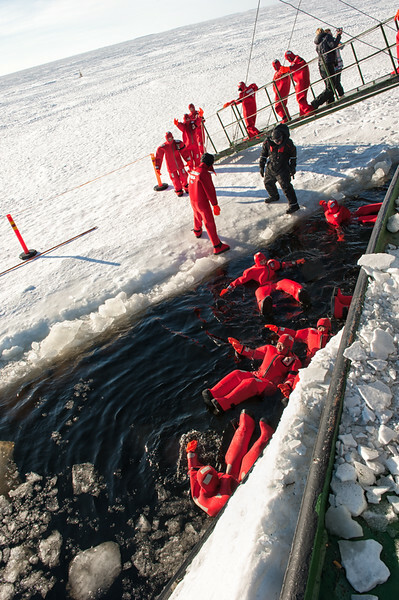 Suiting up in brilliant red survival suits and looking like a group of lost, very uncoordinated (and in some cases, very terrified) aliens, we eschewed the (reasonably) comfortable surroundings of the slab ice and jumped into the small pool of water around the ship’s stern. The first group of swimmers gracefully waddles out into the water. The survival suits were the same ones that all ships in the area are required to carry in case of emergency. They are designed to keep you warm for around two hours floating in near-freezing water and were much looser than the drysuit I wore to go snorkeling in Arctic Norway. The only opening was where the thick rubber sealed around my face. I hardly felt the chilly water as I slid into the water like a clumsy seal. Since my suit was so thick, I didn’t have to do anything to stay afloat; I simply floated along on my back, looking a bit like I was sitting in an invisible lounge chair. In fact, if you ignored the fact that we were all in brilliantly red suits, navigating our way between blocks of ice, we could have been a group of very happy holiday makers in our floaty chairs in a pool in Hawaii. Chilling out on our invisible pool chairs. I floated for as long as I was allowed to. By that point, after about 5-10 minutes in the water, the cold was starting to seep in, especially around my hands where the red suit gave way to hi-vis orange, slightly thinner gloves. I was very happy that I had a perfectly good ship waiting for me (with a perfectly good set of dry clothes). It was much better than having to float indefinitely while I waited for another ship to come rescue me! What do you think your favourite part of a ride on the Sampo would be? Would you jump into the icy water? I went cruising on the Sampo as a guest of Kemi Tourism and Visit Finland, but all opinions stated here are my own. 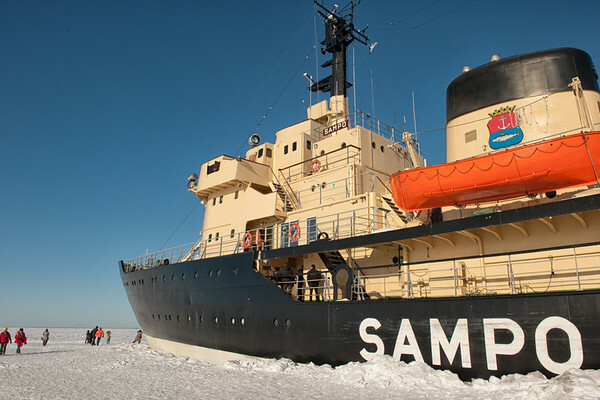 The Sampo looking like it’s parked on the ice. 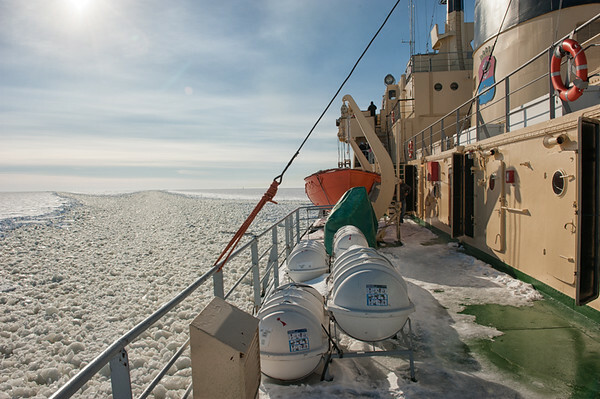 The Sampo cruises into the Gulf of Bothnia 3-4 times a week between late December and mid-April. Cruises, which include a guided tour, lunch (mine was a delicious smoked reindeer soup of which I had a second helping), and floating in a survival suit cost €270. The Sampo leaves from the port of Ajos, which is 11km from Kemi. Transportation can be arranged for €35/person. Those photos are AMAZING! It is so unique to be able to see a ship bashing through ice. Thanks Annette! It really is a truly unique experience. I guess the ultimate icebreaker would be getting to know someone in one of those red suits. How funny and what a cool thing to do while in Finland! LOL Suzy, I hadn’t thought of that until you mentioned it, but it really is the ultimate icebreaker activity! Wouldn’t it be great if they did something like this as the icebreaker at a conference? That sounds so cool! I would definitely give those red suits a try and hop in. You all look like you’re having a great time! That looks terrifyingly cold, but beautiful enough to be worth it. The massive amount of ice almost seems unreal. It was definitely cold, although luckily the weather in Kemi was a lot warmer than the weather in other parts of Lapland! Plus, I was so happy to have a survival suit. It made the experience much more pleasant than when I tried to jump in a pool of ice after being in a sauna!